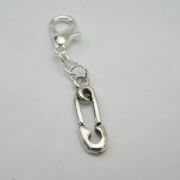 Baby Bottle Clip On Charm. Lovely Gift Idea to be attached to a Bracelet, Gift Bag or anything with a Zip. Baby Dummy Clip On Charm. Lovely Gift Idea to be attached to a Bracelet, Gift Bag or anything with a Zip. 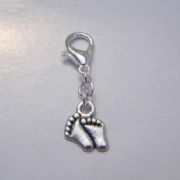 Baby Feet Clip On Charm. Lovely Gift Idea to be attached to a Bracelet, Gift Bag or anything with a Zip. Baby Nappy Pin Clip On Charm. Lovely Gift Idea to be attached to a Bracelet, Gift Bag or anything with a Zip. 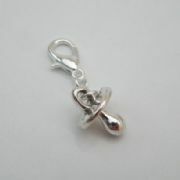 Baby Pram Clip On Charm. Lovely Gift Idea to be attached to a Bracelet, Gift Bag or anything with a Zip. Little Boy Clip On Charm. Lovely Gift Idea to be attached to a Bracelet, Gift Bag or anything with a Zip. Little Girl Clip On Charm. Lovely Gift Idea to be attached to a Bracelet, Gift Bag or anything with a Zip. 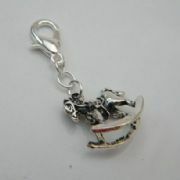 Rocking Horse Clip On Charm. Lovely Gift Idea to be attached to a Bracelet, Gift Bag or anything with a Zip.